There is a saying “No matter how much things change they remain the same” and this holds true for the dwelling place of God! When God first spoke with Moses at Mount Sinai He told him to go and tell the people He would come down in the sight of them all, the presence of God caused the whole mount to quake and the people trembled before Him. (Exodus 19:10,11,16-18). And the Lord said unto Moses, Go unto the people, and sanctify them to day and to morrow, and let them wash their clothes, And be ready against the third day: for the third day the Lord will come down in the sight of all the people upon mount Sinai. And it came to pass on the third day in the morning, that there were thunders and lightnings, and a thick cloud upon the mount, and the voice of the trumpet exceeding loud; so that all the people that was in the camp trembled. And Moses brought forth the people out of the camp to meet with God; and they stood at the nether part of the mount. And mount Sinai was altogether on a smoke, because the Lord descended upon it in fire: and the smoke thereof ascended as the smoke of a furnace, and the whole mount quaked greatly. How scary that sight must have been to behold, but the Holy Mountain known as “New Jerusalem” where the redeemed of the Lord will one day dwell will be a more peaceable place to inhabit. Revelation tells us of it. (Revelation 21:1-4). It is foretold us in the book of Isaiah of the way of life with the Lord that will be different than what we’re used to seeing here as we plant and another eats it, or we build and another inhabits, the redeemed will have the joy of whatever they set their hand to and will no longer labour in vain. God will answer His people before they even call on Him, and there will never be any more hurt or destruction present like we now experience! (Isaiah 65:16-25). That he who blesseth himself in the earth shall bless himself in the God of truth; and he that sweareth in the earth shall swear by the God of truth; because the former troubles are forgotten, and because they are hid from mine eyes. For, behold, I create new heavens and a new earth: and the former shall not be remembered, nor come into mind. But be ye glad and rejoice for ever in that which I create: for, behold, I create Jerusalem a rejoicing, and her people a joy. And I will rejoice in Jerusalem, and joy in my people: and the voice of weeping shall be no more heard in her, nor the voice of crying.There shall be no more thence an infant of days, nor an old man that hath not filled his days: for the child shall die an hundred years old; but the sinner being an hundred years old shall be accursed. And they shall build houses, and inhabit them; and they shall plant vineyards, and eat the fruit of them. They shall not build, and another inhabit; they shall not plant, and another eat: for as the days of a tree are the days of my people, and mine elect shall long enjoy the work of their hands. They shall not labour in vain, nor bring forth for trouble; for they are the seed of the blessed of the Lord, and their offspring with them. And it shall come to pass, that before they call, I will answer; and while they are yet speaking, I will hear. The wolf and the lamb shall feed together, and the lion shall eat straw like the bullock: and dust shall be the serpent’s meat. They shall not hurt nor destroy in all my holy mountain, saith the Lord. 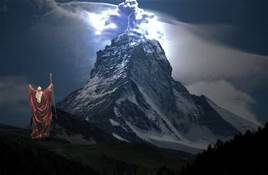 His Holy Mountain will be a place our Lord Jesus will reign as Lord of Lords and King of Kings, and only the things which cannot be shaken will remain in it. Only a God fearing people who Love the Lord and the righteousness He stands for will dwell in this city of the Living God! (Hebrews 12:21-29). And so terrible was the sight, that Moses said, I exceedingly fear and quake:) But ye are come unto mount Sion, and unto the city of the living God, the heavenly Jerusalem, and to an innumerable company of angels,To the general assembly and church of the firstborn, which are written in heaven, and to God the Judge of all, and to the spirits of just men made perfect, And to Jesus the mediator of the new covenant, and to the blood of sprinkling, that speaketh better things than that of Abel. See that ye refuse not him that speaketh. For if they escaped not who refused him that spake on earth, much more shall not we escape, if we turn away from him that speaketh from heaven: Whose voice then shook the earth: but now he hath promised, saying, Yet once more I shake not the earth only, but also heaven. And this word, Yet once more, signifieth the removing of those things that are shaken, as of things that are made, that those things which cannot be shaken may remain. Wherefore we receiving a kingdom which cannot be moved, let us have grace, whereby we may serve God acceptably with reverence and godly fear: For our God is a consuming fire.